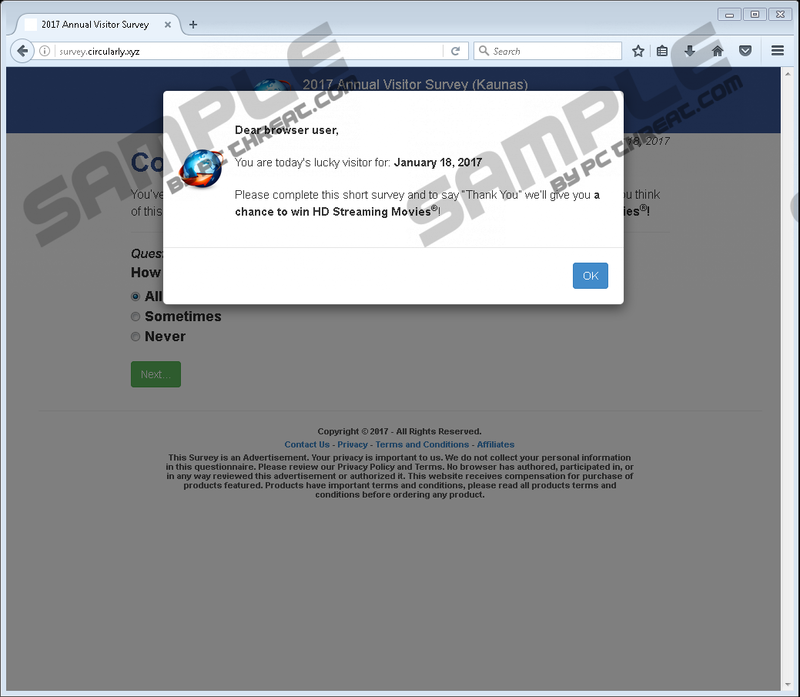 Survey.circularly.xyz may look like a browser hijacker, but it is actually an adware server that can be used by various adware programs that need to promote third-party content. This domain may appear on your browser when you click outgoing links to unfamiliar websites. However, no matter what the source might be, the truth is that you have unwanted applications installed on your computer, and you have to terminate them at once. Otherwise, you will not be able to get rid of the effects of constant redirection. For the manual removal instructions, scroll down to the bottom of this description, but the fastest way to get rid of this issue would be acquiring a legitimate antispyware tool. So what are the potential routes that the adware programs take to your computer? There are many ways to get infected with adware applications and, most of the time; users do not realize the danger that might hide behind regular online activity. 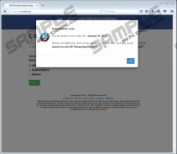 For instance, adware programs might be hiding behind pop-up ads and other interactive content on online gaming websites, file-sharing sites, and other popular pages. Also, adware programs could be bundled together with freeware that is widely available for download at file-sharing websites. Technically, it should be possible to avoid installing additional freeware apps if users were more attentive during the installation process. There are steps in the installation wizard that inform users about the additional applications, and ask them whether they want them installed. Of course, users are too used to skipping these steps because they think all the installations are practically default, and they just need to keep on clicking “Next.” Unfortunately, this kind of behavior eventually results in a lot of unwanted installations that can prove to be dangerous to your computer’s security. Therefore, whenever you are about to install a new program, be sure to check out every step in the installation wizard. You might as well prevent an adware infection this way. What would happen if you get redirected to Survey.circularly.xyz anyway? It depends on the program and service that makes use of this adware server. For example, in our case, the domain offered users to fill out an online survey that would “give you a chance to win HD Streaming Movies.” It may also offer to install fake programs. For example, you could be redirected to a page that says you have to run a full system scan with online scanner or that you are missing a codec and now you have to install something new. Please note that developers of reliable applications and browser add-ons would not indulge in such marketing tactics. And yes, the fact that you keep on getting redirected to unfamiliar websites via Survey.circularly.xyz just shows that the adware programs installed on your computer try to make as much money as possible. After all, you help them generate a financial profit every time you click the promoted links or land on the affiliated sites. This does not mean that the programs you have on your computer try to infect you with malware. They are far too simple for that. However, adware apps could be easily exploited by cyber criminals because they are really vulnerable and have a lot of security loopholes. So, in the worst-case scenario, this seemingly annoying nuisance could end up in a serious malware infection that would steal your personal data and totally destroy your computer’s system. To avoid that, you will do yourself a favor if you terminate all the applications that could make use of Survey.circularly.xyz right now. You do not know which programs are using Survey.circularly.xyz? Don’t worry: You can scan your computer with the SpyHunter free scanner. A full system scan will tell you exactly which programs and applications cannot be trusted. If you have a lot of malicious files on-board, the scan will display that too. Once you have a list of potential threats, you will be able to terminate them without further delay. Finally, to avoid similar issues in the future, you should stay away from third-party file sharing websites. Even if you invest in the best computer security tool out there, your web browsing habits are still just as important in protect your system from harm as the security program you choose. So please be responsible online. Select Add or remove programs and uninstall the unwanted programs. Click the Refresh Firefox button on the new tab. Press the Refresh Firefox button again and click Finish. Press the Show advanced settings section at the bottom. Scroll down and press Reset settings. Quick & tested solution for Survey.circularly.xyz removal.